Tonometry is instrumentation that allows us to measure intraocular pressure – the pressure inside the eye. 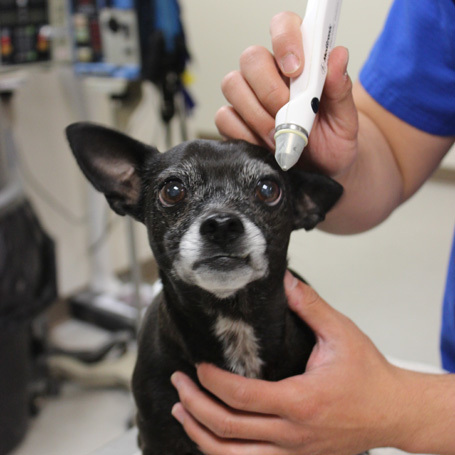 In order to measure this pressure we use a Tono-Pen, a handheld device shaped like a large marker. It provides a digital readout of the amount of force being exerted on the eye. Tonometry is used to diagnose glaucoma, a common and painful disease characterized by increased fluid pressure inside the eye. It often damages the ocular nerve causing decreased vision (tunnel vision) and even blindness. Early detection is key in preventing permanent vision changes. Preserve your pet’s vision by scheduling an appointment today.